Easy-to-Use Web-based Reporting provides a variety of usage, billing and inventory reports, project or job tracking and allows the user to monitor current and historical data. Transaction data is processed into our database where it can be accessed from anywhere with an internet connection any time of the day. Hundreds of machines located all over the country can be administered from one, centralized location. 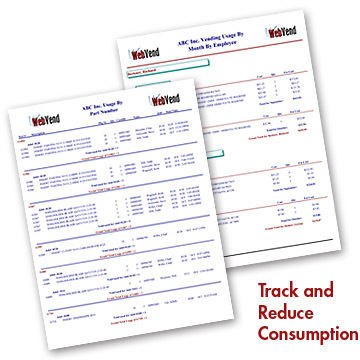 WebVend lets you track and reduce consumption. Samples require Adobe Reader. Click below to download.